For the last few years, I have been performing regularly with singer/songwriter Clare Robertson, as the duo 'Witches' Brew'. We came together through a mutual love of traditional Scottish and Irish songs, good harmonies and arrangements and of songwriting. We first collaborated on the song 'Spirit of Lochwinnoch', for the play of the same name, written by local writer Franzeska Ewart. We have performed at the Star Folk Club, at the Lochwinnoch Arts Festival and recently supported the Largs Gaelic Choir and performed at the Association of Weavers Box Opening at the Trades Hall in Glasgow. We have presented a show at the Edinburgh Fringe festival for the last four years. Last year's show was described as "massage to the heart". We are looking forward to more performances, using a wide range of instruments from clarsach and guitar, through to African instruments. 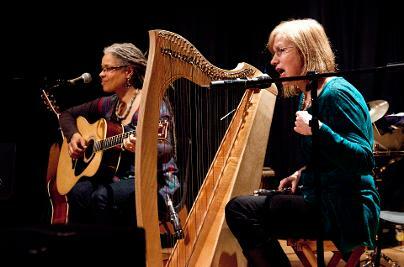 "a night of brilliant folk music by local duo Witches' Brew" (Councillor Andy Doig in the Gryffe Advertizer). Look out for performances in my Upcoming Gigs page.